Each century, about two massive stars in our own galaxy explode, producing magnificent supernovae. In the Universe at large, a supernova event occurs every second. Astrophysicists at the level of Stephen Hawking believe that these massive explosions may be responsible for killing off advanced extraterrestrial civilizations –a major factor perhaps in the "Great Silence" of the Fermi Paradox. 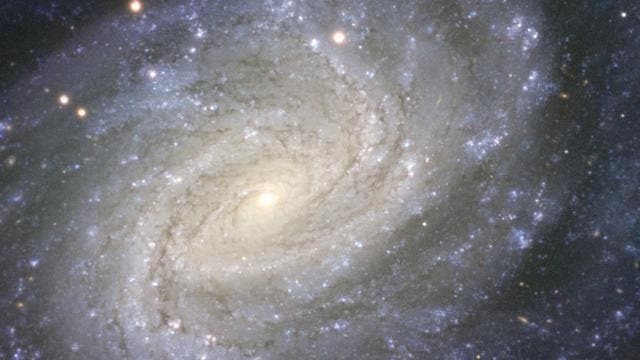 A new image taken with ESO’s Very Large Telescope shows the galaxy NGC 1187. This impressive spiral lies about 60 million light-years away in the constellation of Eridanus (The River). NGC 1187 has hosted two supernova explosions during the last thirty years, the latest one in 2007. This picture of the galaxy is the most detailed ever taken. The galaxy NGC 1187  is seen almost face-on, which gives us a good view of its spiral structure. About half a dozen prominent spiral arms can be seen, each containing large amounts of gas and dust. The bluish features in the spiral arms indicate the presence of young stars born out of clouds of interstellar gas. Looking towards the central regions, we see the bulge of the galaxy glowing yellow. This part of the galaxy is mostly made up of old stars, gas and dust. In the case of NGC 1187, rather than a round bulge, there is a subtle central bar structure. Such bar features are thought to act as mechanisms that channel gas from the spiral arms to the centre, enhancing star formation there. Around the outside of the galaxy many much fainter and more distant galaxies can also be seen. Some even shine right through the disc of NGC 1187 itself. Their mostly reddish hues contrast with the pale blue star clusters of the much closer object. NGC 1187 looks tranquil and unchanging, but it has hosted two supernovae explosions since 1982. Supernovae are amongst the most energetic events in the Universe and are so bright that they often briefly outshine an entire galaxy before fading from view over several weeks or months. During this short period a supernova can radiate as much energy as the Sun is expected to emit over its entire life span. One class of supernova explosions occur at the end of a massive star’s lifetime — stars more massive than eight solar masses — when its nuclear fuel is exhausted and the star is not longer able to counteract gravitational collapse, producing a violent explosion. Alternatively, a supernova explosion can also occur in a binary star system, in which a carbon-oxygen white dwarf is pulling matter from a higher-mass companion star. If enough matter is transferred, the star will begin to collapse, producing the supernova explosion. In October 1982, the first supernova seen in NGC 1187 — SN 1982R was discovered at ESO’s La Silla Observatory and more recently, in 2007, the amateur astronomer Berto Monard in South Africa spotted another supernova in this galaxy — SN 2007Y. A team of astronomers subsequently performed a detailed study and monitored SN 2007Y for about a year using many different telescopes . This new image of NGC 1187 was created from observations taken as part of this study and the supernova can be seen, long after the time of maximum brightness, near the bottom of the image. The data was acquired using the FORS1 instrument attached to the ESO’s Very Large Telescope at the Paranal Observatory in Chile.